Within every industry, a product comes along that sets a new “gold standard” for which all comparable models are judged. In the world of log splitting, the Dirty Hand Tools 100171 log splitter is that product. It is frequently compared against others such as a popular model offered by WEN and other product lines from various companies. But with a perfect balance of price, function, and durability there is currently no another log splitter that surpasses it. A true heavy-duty splitter that splits hardwood and softwood with ease. 10.9 second cycle time down and back. Towable : 2″ ball with safety chains DOT approved high speed 16″ road tires. Powerful enough to split hardwood. 6.5 Gallon Hydraulic System Capacity. Handles up to 25-inch logs. Includes log catcher and built-in log cradle. Heat treated steel for long-term durability. ✓ View or download the MANUAL for the Dirty Hand Tools 100171 log splitter. Anyone that has a regular need for at least a cord (wood stacked at 4x4x4” measurement) of wood should begin looking into the purchase of a log splitter. The average household that uses firewood as it’s primary heating source requires five cards annually to last through the fall and winter, those that use it as a secondary source averaged a use of two cords. Commercial uses vary but typically exceed the needs of the typical homeowner. The typical person requires at least 4 hours to cut a cord of wood equipped with only an ax. This time can be lengthened considerably, depending on the fitness level of the individual, the type, and age of the wood and his or her level of experience. A log splitter can produce triple if not quadruple the amount of wood in the same time. All of these components work together to create a streamlined log splitting machine. There are many tools the handy homeowner or manual laborer can skimp on to keep the cost at the bare minimum by getting a cheap off-brand option. A log splitter is not one of them. This job must be able to safely and efficiently tackle the job required. There are two key features to consider when making a purchase of a new log splitter tonnage and power source. Tonnage | What Size Log Splitter do You Need? Tonnage is the amount pressure that the machine exerts in order to split the piece of wood. Tonnage can measure from the low 5 tons to the high 60 tons for commercial machines. The tone required depends on the wood type, size, and maturity. Wood types between the region and largely depend on the location of the individual. Some such as oak, are highly accessible and are naturally harder type as compared to others such as softer woods such as birch. Turn those logs into firewood quickly and safely. Harder woods are more desirable as they burn slower when used for firewood and are far more durable when used as a building resource. These type of woods require a substantial force when splitting. Greater force is also needed to split younger, “green” trees and for larger logs. Dirty Hand Tools 100171 exerts 22 tons of force and is able to handle logs that are as much as 36 inches in diameter and 25 inches in length. At this amount of force, the 100171 can take on a seasoned 24” inch log with ease and both green and seasoned logs with girths measuring below this mark. There are several power sources as it pertains to log splitting options. There are manual options that use the force of pressing or pulling a machine assisted blade. Electric options that are powered by connecting the splitter to an external electrical power source from a building or generator. That power source enacts a hydraulic pump that presses a blade through a log. The third option is a gas splitter that operates similarly to an electric model in that it also uses a hydraulic pump system. However, rather than an electric engine powering the hydraulic pump a fuel tank of gas provides power. The last and final is a kinetic system. This system uses a gas engine to propel a flywheel rather than a hydraulic pump. The Dirty Hand Tools 100171 is a gas operated log splitter. Using a gas operated machine offers several benefits. Compared to an electric model it is able to exert far more pressure, resulting in an ability to take on larger, younger and harder types of wood. Electric log splitter means no fumes and can be used indoors. The average electric model rates below 10 tons of pressure. It also eliminates the need for a power outlet, which increases portability. A kinetic option operates at a much faster cycle speed. Many boasting speeds as low as 3 seconds which reduces work time significantly. The Dirty Hand Tools 100171 gas model, features a speed of around 10 seconds. Hardly a speed to scoff at, and can mean hundreds if not thousands in savings cost when compared to kinetic models. A kinetic log splitter capable of a tonnage equivalent to the Dirty Hand Tools 100171 can cost nearly double the cost. Kinetic versions also tend to have difficulty splitting wood that has knotted and spiraled wood grains a problem that seems to elude the gas based Dirty Hand Tools model. Split logs up to 14″ in diameter and 25″ in length in under 14 seconds. ✓ View or download the MANUAL for the PARTS LIST for the WEN Lumberjack 56222. WEN offers the Lumberjack 56222, a gas-powered log splitter that also operates with 22 tons of pressure. With a tonnage equitable to what is offered with the Dirty Hand Tools 100171 and identical fuel sources, the two are frequently compared. A closer look at the features offered reveals that these two are miles apart in performance despite surface level similarities. Split either vertically or horizontally depending on your needs. With the allotted pressure as well as the inclusion of a built-in auto ram, the 100171 is able to complete a full up and down cycle within 10.9 seconds compared to 14 seconds by the WEN model. As mentioned earlier, the log cradle and wedge built into the Dirty Hand Tools 100171 log splitter is capable of holding and splitting logs 36 inches in diameter and 25 inches in length. While the WEN Lumberjack can also handle 25 inch logs it cannot handle a girth that exceeds 14 inches in diameter. Unlike the WEN that may only be used in a horizontal position, the 100171 is capable of operating in both vertical and horizontal positions a very useful feature depending on the terrain, needs and preferences of the user. One gallon tank powers this splitter for over 4 hours of half-load run-time. These additional perks offered with the Dirty Hand Tools 10071 comes in addition to a list of features that come fairly standard with many of the gas-powered log splitters on the market. They include: EPA and CARB approval, can be towed and operated in remote locations, built-in log cradle, log catcher, 2″ towing ball, high-speed road tires and a suction screen and return line filtration. As always, the safety of the utmost importance when using heavy-duty, professional grade tools such as the Dirty Hand Tools 10017. Being that it is a gas operated machine, it should only be used outdoors, to avoid the risk of inhaling potentially lethal carbon monoxide. Understand that any machine capable of exerting 22 tons of pressure can be deadly, while in operation no one should be in a position close enough to come into contact with the high-pressure wedge. 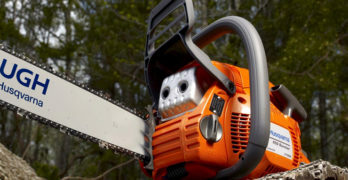 Take precautions for flying wood splinters by wearing protective gear such as goggles and by having all nearby persons stand at a distance far away from the machine outside of the designated “operator zone” as outlined in the manual. Steel toe boots, tightly drawn gloves and noise canceling earphones should also be used. 17-second cycle time and automatic returns. Operate the machine on the dry level ground and use a wheel block to prevent rolling while in use. When towing never exceed 45 miles per hour and ensure that fuel valve is in the off position to prevent engine flooding. Consult the manual, which comes with the purchase and is available online, for general maintenance instructions as well as more operation details, safety instructions, and towing guidelines. The Dirty Hand Tools 100171 is an excellent log splitter for price and features — and so is the WEN Lumberjack 56222, especially when you compare them to electric splitters, kinetic splitters. These are both very well-priced and well-made so you can’t go wrong with either option. we think it’s important to offer you choices because every homeowner has different requirements. We have many log splitter articles here at Chainsaw Journal but if you want some more options read this articles for additional choices. From page 5 of the WEN manual for the Lumberjack 56222. Always block the wheels to prevent unintended movement of the log splitter. Safety equipment/controls: always operate the log splitter with all safety equipment in place and in good working order, and all controls properly adjusted for safe operation. Know how to stop: be thoroughly familiar with all controls and with the proper use of the equipment. Know how to stop the log splitter and relieve system pressures quickly if needed. Daylight only: Only use the log splitter in daylight so you can see what you are doing. Smoking/sparks: never smoke while operating the log splitter, and never operate near sources of sparks or flames. Hot muffler: if you are starting a warm engine, stay clear of muffler. It may still be hot enough to burn you. Never leave the machine unattended while the engine is running. Stay sober: never operate the log splitter while under the influence of alcohol, drugs, or medication. Other exhaust dangers. Engine exhaust, some of its constituents, and certain vehicle components contain or emit chemicals known to the State of California to cause cancer, birth defects, or other reproductive harm. Avoid excess inhalation of exhaust. Visit WEN to learn more about their fantastic products.